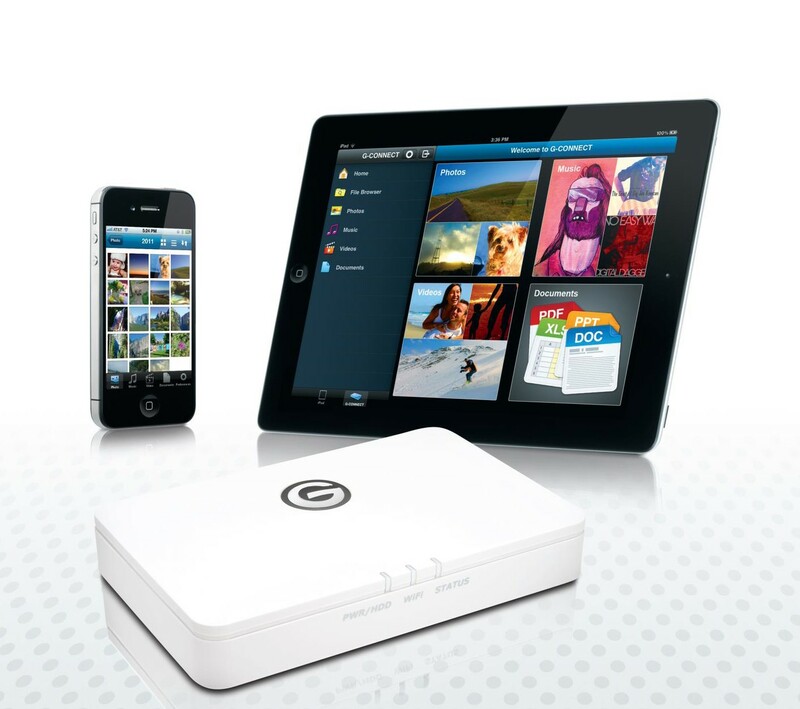 G-CONNECT – Wireless Storage for iPad® and iPhone® | G-Technology. Having just bought one I thought Id write a quick blog about the G-Connect from G-Technology (which I believe is a subsidiary of Hitachi) Looks Cool doesn’t it? So with that in mind I thought – Brilliant! A wireless device that can be used to give me “expanded capacity for iPhone and iPad” Ill have one of those thank you very much… You see one of the biggest challenges I get while on location training Mobile Journalists is how do I back up my (or the studnets) content – or save my finished stories from my iPhone/iPad. 1. Connect your device to a Mac/PC open iTunes and copy the content from the App. 6. Connect your iDevice wirelessly to a WiFi storage drive and copy the file to the Video Folder. Perfect – the G-Connect is just the solution… but STOP! NO ITS NOT! The one fundamental thing the G-Connect Apps CANNOT DO is a direct upload of content from your iDevice camera roll to the WiFi drive – so no direct backup of your Photos or Videos! In the G-Connect App you can DOWNLOAD a file from the G-Connect to the iPad Camera Roll (or to a folder within the G-Connect App on the iPhone) in what they refer to as “OFFLINE MODE” but you cannot – or at least I CANNOT find a way to backup TO the G-Connect directly from my iPhone or iPad. RTFM you say? Yes Ive read the manual in a state of bewilderment – how the hell can they release a product that has SO MUCH potential and then fail to provide the simplest yet most required part of the workflow??? How? I CANT TYPE ANY BIGGER THAN THIS BUT I WOULD IF I COULD!!! Seriously G-Technology / Hitachi as makers of highly reputable, industry standard Raid drives etc etc can you PLEASE get your S*** together and fix this- its bloody insane! Ugh… I just bought one of these. For the same reason.. that “expanded capacity for iPhone and iPad”. Reputable company, product seemed legit. Was even on sale for a great price (now I know why). Wish I had seen your post first. Sigh. Massive FAIL, G-Technology. Same mistake here too. I bought one for my wife while I was in the US as she was struggling with insufficient storage on her iPhone!! But now I realize that this device is a Fail!